We are fortunate to live in the country surrounded by wildlife - a great inspiration for my paintings. 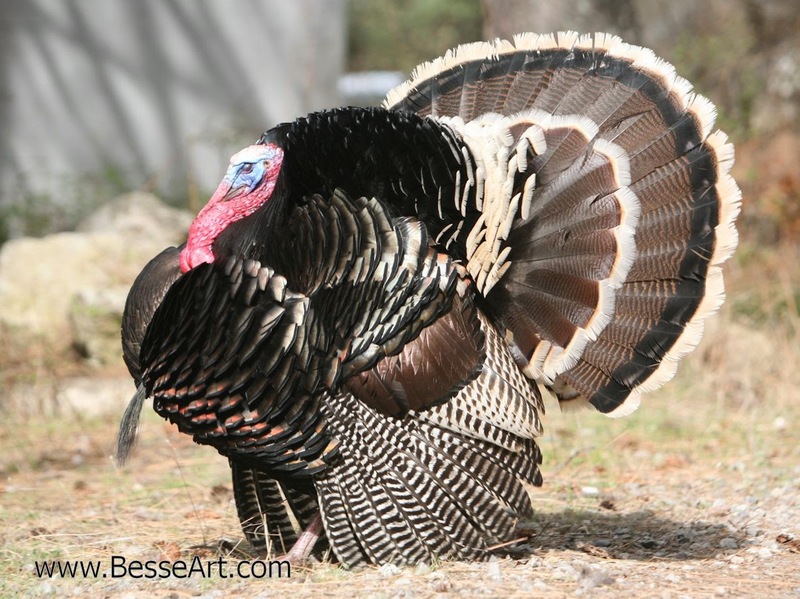 Turkeys and deer are common. Grouse, quail, porcupine, 5 species of woodpeckers including pileated woodpeckers, coyotes, and flying squirrels are also visitors. The occasional moose, bear, bald eagle, and sharp-shinned hawk are rare treats. Yesterday I saw "our" snowshoe hare. It was not a very long look. Just long enough to see his white feet and paws before he hopped into the brush. We always see him roughly in the same place and alone. Is he the bravest of a group or alone in the woods? Snowshoe hares live 3 -5 years in the wild depending on how rich the area is in predators. Unless this guy is really, really old we've had more than one. But, is he the last? Sometimes we go a year without seeing one. I could spend some time trying to get a photo. I know where he hangs out and it would be fun to see him for a longer stretch than the usual fleeting glance. But, getting a photo would almost certainly add stress to his environment. It isn't worth it. I am satisfied with the knowledge that a snowshoe hare lives here. I will leave you with a photo I did take this month in our yard. This guy could care less about the camera. Despite the fact that I love birds, I sometimes find myself placing them in broad categories: songbird, shorebird, gull, raptor, LBB (little brown bird). When I take the time to really look at them, it is then I see their amazing beauty. This is a willet and I admit I had trouble with the i.d. Three of my eastern U.S. bird books had only the winter plumage which is quite different. This bird is from the eastern group of willets which feed along beaches, mudflats, and rocky shores. They breed on barrier islands and along coastal salt marshes, which is exactly where I found this bird. 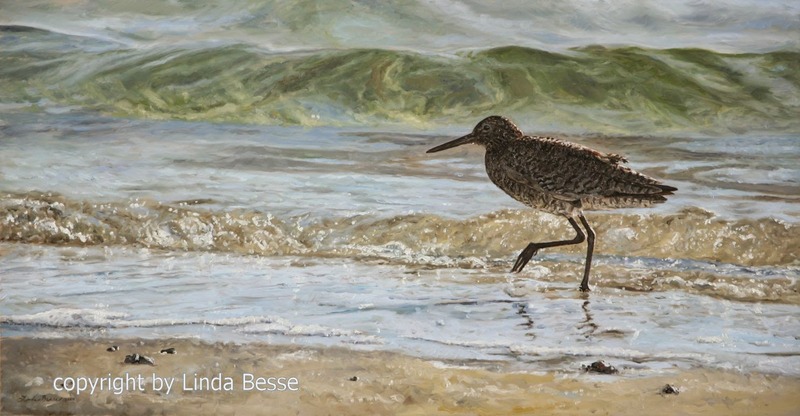 Now that I have painted this piece, for me a willet is no longer just a shorebird. One of the things I like about oil paint is that it doesn't dry instantly. When painting water, the slow drying time enables me to blend the edges. I can "push and pull" the paint around my board until the image feels wet. If it looks static in a section, I can go back in and move it around some more. On the other hand, if the painting starts to look mushy, I can redefine some edges and still keep them soft as they blend into the surrounding paint. If I have a limited time to paint I generally do not start a large section of water. Hours and hours of uninterrupted painting works best as I think through my water passages. From the last post, I have brightened the sand reflections in the oncoming wave. The next closer section is also more defined and brighter. A tricky area is the middle wave. 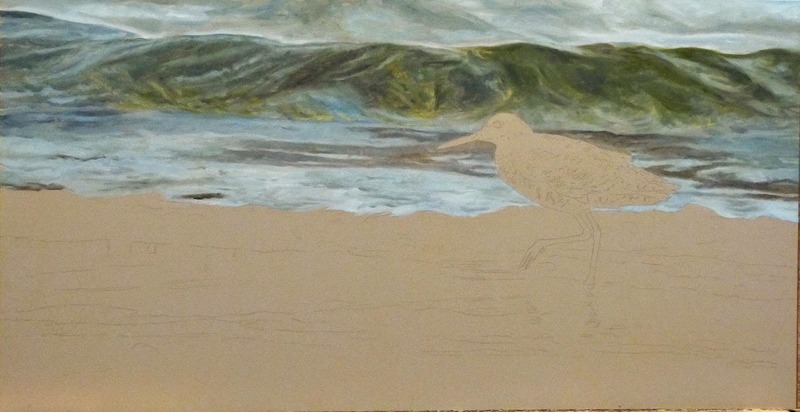 I started with raw umber, some yellow ochre, and naples yellow and titanium white. As is usually the case when I am unsure of the color, my first go around was too light. Adding more raw sienna and a little van dyke brown added more depth. Sometimes I wait to add highlights until the section is done. Here, I found it helpful to put in the highlights as I painted. They gave structure to the wave. For the closest water section I used cerulean blue with some hints of manganese blue. These warm blues helped bring this section of water closer. The foam. I started with the dark forward color, then added the lightest top section. Mixing a middle tone, I painted it in-between the two. Seems to work. Being an artist is a risk. Not only financially but most artists put their whole heart into their work which is then evaluated by others to determine whether it is worthy of purchase. This is not a profession for the faint of heart. In such a risky venture, wouldn't it make sense to reduce the risk? No artist wants a piece to "fail" and not sell. Therefore, if you paint a beach scene with sand dunes and flowing grasses and it sells, shouldn't you be back at the easel and paint another beach? Maybe another 7 beaches? How about in 5 different sizes and you could vary the frame color. Is this a new story for me to tell? Am I telling the story in a fresh way that I haven't seen before? Hence there is a lot of variety in my work. I am mostly a wildlife artist because it is easy for me to get excited about my subjects. But, whether it is a violinist in Genoa, outlaws of the Old West, or a sailboat on a summer day, I have other stories I want to tell. Variety - the spice of life. Okay. So I have a variety of genre in my work. Wouldn't it make sense to approach each piece the same way? Limit the experimentation to reduce the risk. I firmly believe that one's artistic growth is tied to experimentation. I could paint different subjects all day long and my growth as an artist would be slower than if I tried some new techniques. I've tried large paintings almost solely painted by glazing; metallic gold gesso base; Venetian red gesso; gray-toned gessoboard, tight detail, impressionistic interpretations, broad landscapes, and portraits with no discernible background. For this painting, I am trying a soft look and using a tan/brown-toned gessoboard. There isn't as much a learning curve for my palette as there was with the Venetian red gesso - or maybe I am used to adjusting my palette on the fly. Being an artist is a risk. I believe playing it safe in my art is too great a risk. It may seem that painting a slight variation of a successful piece would give one the best chance of selling. Maybe....for a while. But it is a limiting experience for both the artist and the collector. The greatest opportunity for growth is rooted in both variety and experimentation. New subjects, new ideas paired with different approaches. That may seem like a risk but I believe it is the best way to become the best artist I can be. I should have taken photos while I was working on the violin and violinist but I was having too much fun. One night I wrapped up after 3:30am, another morning I was at the easel before 7am. The best part is that I had a chance to paint with fellow artist Lee Kromschroeder. He has been a friend for years and had a show in town. During the week he stayed at our house, he worked on an extra piece for the show at Pacific Flyway Gallery while I worked on this painting. Lee's insight and suggestions made this a better painting. Thanks Lee! One main suggestion was to take down the brilliance of the yellow building behind the central figure. It was such a pretty color but once I decided on keeping the whitish hat, the yellow needed to be more subdued. This subject matter was a departure for me. I've never painted an instrument before. But, in some ways, this piece fits right in with my other work. 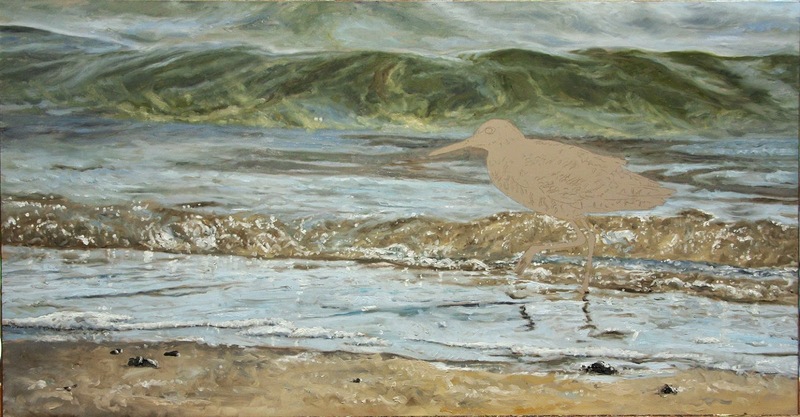 In my wildlife paintings I try to create a story, a sense of place. And if the emotion I felt when I was there comes through, even better. 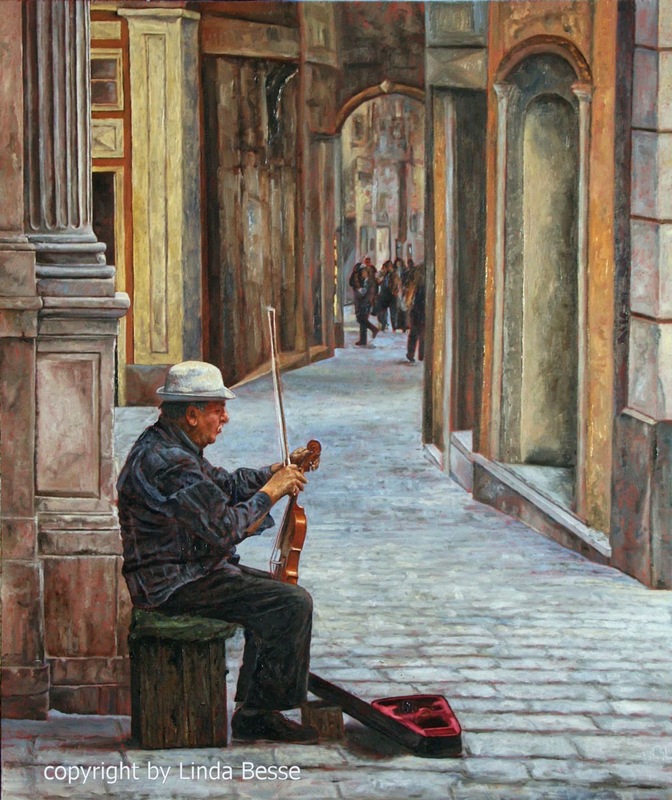 I wanted to tell this story on the centuries-old streets of Genoa - and wait for the first notes to play.